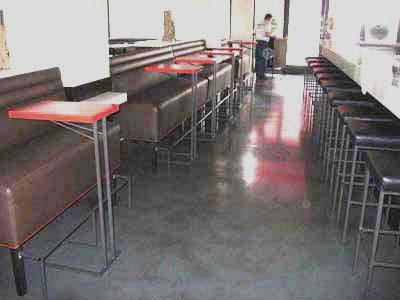 A west coast metal furniture manufacturer builds metal bar stools, counter stools, spectator stools, vanity stools, swivel stools, dinettes, kitchen chairs, custom furniture, restaurant furnishings, commercial furniture, speaker stands, restaurant seating, laminated art table tops, counter tables, pub tables, casino stools, bar chairs, spectator stools, and many other custom made houseware accessories and sells direct to the public at factory direct prices. Because furniture is a major purchase we try to give you as much information as possible. If you are in a rush, you may click on the links on the left to view our product. If you want to take the time to learn about who we are, what we offer and the information you need to make an intelligent choice, click on the factory in the middle of this page. American made bar stools starting at just $97.96 with shipping included. 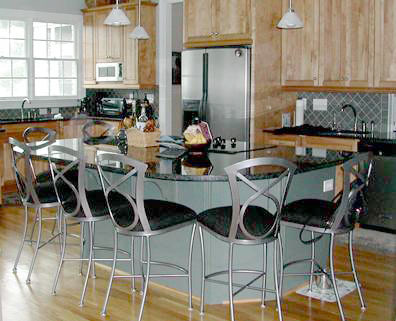 BECAUSE YOU ARE BUYING DIRECT FROM THE FACTORY, NOT A STORE, WE CAN BUILD YOUR BARSTOOLS TO FIT YOUR EXACT NEEDS! Bar stools and custom snack tables for Magnolia, a restaurant in downtown Los Angeles, CA. We specialize in 32" and 34" Bar Stools. NO EXTRA CHARGE! 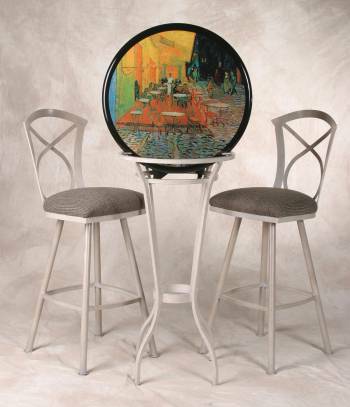 Click here for more information on tall bar stools. We also build 36" Spectator and Billiard Stools. Click here for more information on spectator stools. 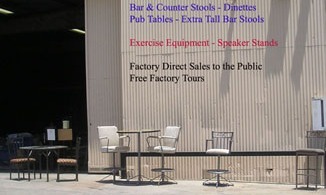 Enter our furniture factory for factory direct prices. The only site where you, the consumer, can buy metal bar stools, counter stools, swivel stools, vanity seating, kitchen chairs, dinettes, commercial furniture, tall bar stools and other metal furniture direct from the furniture manufacturer at factory direct prices! One bar stool for your home or hundreds for your commercial furniture needs, we can fill your order at a fraction of retail cost. We also build professional speaker stands, monitor stands and exercise equipment. Sign up for our free Newsletter and receive notices of new products, special discounts, decorating tips and enter our monthly drawing for valuable gifts. PLEASE NOTE OUR NEW PHONE NUMBER. SHOULD YOU COME ACROSS OUR OLD PHONE NUMBER ON ANY OF THE INTERIOR PAGES, PLEASE BE SURE TO CALL THIS NUMBER. THANK YOU. We are proud of what our customers tell us. Received the chairs in good order on Jan 22nd. It was a long wait but worth it in the end. They are really made well and will last forever. Will check your chairs out at the Academy Award presentation. 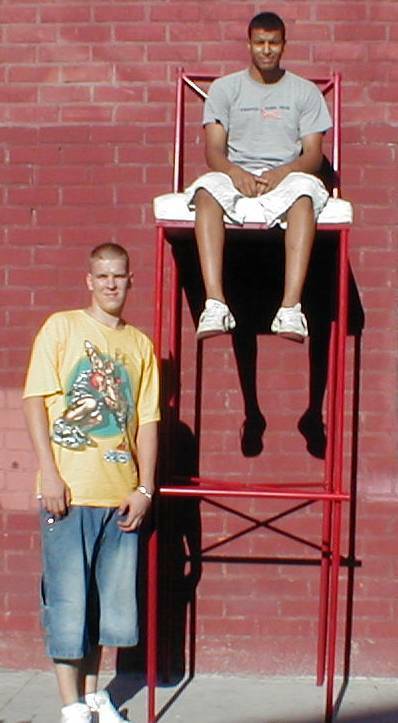 to vist our web site. This website is copyright USA Fitness Equipment Mfg. Inc.